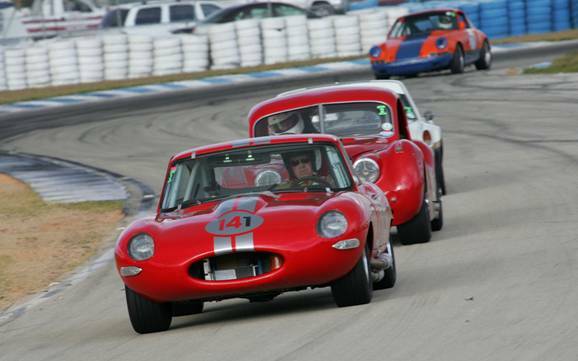 After an extensive build ( 5 years) I took the E type to Daytona untried for it’s first race, the only certainty was the engine that Bill Terry at Terry’s Jaguar had built for me. Thursday test day - the car runs strong and feels fast but I am not working the engine too hard; keeping the rpm down and watching the oil pressure water temperature etc closely - no problems there. Tried a spring change - that did not make much difference but handling is not as good as it could be. The rest of the day went well I turned the engine speed up in the last session and she flew around the track - nothing in my group could pass me on the banking but the infield was another matter. Friday practice - I decided to take the revs up to 6400 but mainly shifted at 6000 - “WOW’ - the speed on the banking was amazing and the car was really steady. I felt comfortable but was not happy with my infield handling, not having enough experience I did not try to change anything so I decided to run what I had and make it up on the banking and boy did it! I passed a Porsche 911 on the start finish line at 6400 rpm in 5th gear. After the session I tracked him down and inquired if he knew what speed he was going when I passed him - “Oh,” he exclaimed, “that was you was it ?” He stated that he had had the car for a while and was aware of his speed, and to my amazement claimed he was running around 160 mph when I went by. I have driven fast cars and motorcycles all my driving life, and the Daytona banking in my Fiat race car (which managed 125 mph) and I can tell you this felt like 170 mph - what a rush! Despite the infield handling I managed to qualify 21st with a 2 minute and 14 second lap time - 2 tenths behind Wavey Davey in his XK120 - another Bill Terry engine - Davey can drive that 120 and it is fast! Basically, all I did during the day was jet up a couple of times, block off some radiator and oil cooler. Then came the qualifying race - I made up 2 seconds and seven spots which put me 14th for the feature race on Sunday which after the other cars failures and attrition had me starting 5th in the feature race. This is a race I was looking forward to - probably too much! A bunch of guys bought their cars from England and I had gotten friendly with one of the drivers, Kevin Doyle, and he had bought his great looking XJ12 Coupe. 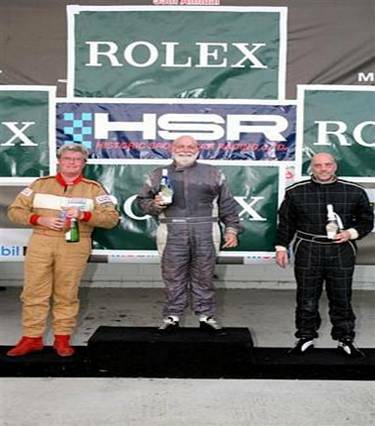 I had watched this race before - it is only British sports cars over 1500cc against American muscle cars, and the top three of each group get a podium and a medal. Now Larry Ligas in his fast and beautiful E-Type is always top Brit car - I thought I might have a chance at a third spot. I started 12th behind Wavey (XK120) and Richard Masters driving a 6 liter XJS Jaguar (another car from England) and next to me was Kevin in his XJ12 Coupe - it looked like it might be fun! The flag dropped and we were off - by the second lap Kevin and I had passed the other 2 Jags ahead of us, and by the third lap we were side by side on the super stretch heading for the bus stop around 150 mph. Well this is where I was having too much fun - I missed my braking point, spun and brushed the tire wall. I was not sure of any damaged so I retired the car and Kevin went on to win the medal for a third place finish of the British sports cars. I was happy about that - those guys had come a long way. My fastest lap was 2 minutes and 12 seconds - I can beat that! I should point out at this time I was born in England but now live happily in Daytona Beach, Fla.
Now if you are wondering how a 4.2L 6 pot can run side by side with a 6L 12 pot ask Bill! So we finished the day on a high - I was a little disappointed but not so much that a couple of drinks at the after race social soon made me forget. 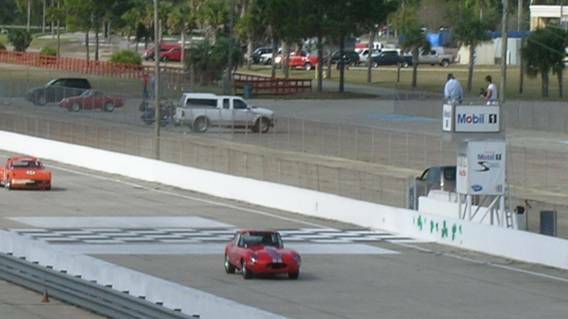 After all it was my first races with the E, I was informed that I had broken the GT2 record for an E type at Daytona (if I am wrong I apologize), had gone my fastest at Daytona ever, had made some great new friends, and I was racing again on Sunday. Does it get any better than that?! Oh it does, my new best friend Kevin took us out to dinner. I have not mentioned the weather yet because as usual it was perfect - if you ever get a chance to go to the Daytona HSR races it is worth the effort. It is a great four-day program and the weather always dry and sunny. As I said, due to the heavy toll Daytona has on race cars I started 5th in the feature race behind four very fast Porsche 914 sixes, two of which were from the Brumos stable. Now it would have been possible to pass a couple of these into turn one but with my infield handling I did not want to try it so on the start I ran up alongside the car in front and then dropped back for turn one and followed them through the infield. By the time we took to the banking the gap was too great to make the horsepower count. Of course those cars do not lack horsepower and a couple of them were running 2 minute and 3 second laps - not too shabby. After a couple of laps I caught and passed the car in front - I think he was having problems and thought well if another guy does I could get a third and a podium. Unfortunately one lap later I picked up a vibration on the banking in NASCAR turn four so I slowed through the start finish line and a pack of three cars came by into turn one - well the damage was done and there was no getting them back. The vibration cleared (probably just tire rubber) and I was chased to the finish by a 1996 turbocharged rover that one of the English guys bought over - there was no way he was going to get by! So I finished 7th, won a medal for my class and gained some points - I was happy so I took my wife, Allie, and my crew, Bill, Joyce, Ziggy and his son Brent, out to dinner and we reflected on a wonderful race weekend. We did not plan to go to Sebring but I had not had enough fun! After Daytona I had to change the set up to suit the different track - mainly taking rear camber out. Also, I changed the front camber, the toe out, the ride height, and added more anti roll bar leverage, checked the whole car over, and gave it a good cleaning, It’s amazing the crud that builds from the track never mind the sand blasting the paint gets from Daytona. I decided not to run the test day and arrived in the middle of testing (Thursday afternoon). My wife Allie went to Orlando to pick up my pal Kevin who flew in from England to help - now here’s someone who loves racing (Kevin that is, not the wife, that‘s to say she enjoys the racing but not all the blah, blah, blah that goes with it). Practice and qualifying was uneventful apart from learning those 17 turns 3.7 miles all over again. The handling was much better - the car would dig in on the corners instead of trying to spin out - there was a little over steer but not bad and later tire pressure changes improved things even more. I qualified 22nd overall this was a huge group as 2 and 3 were running together a long way back but I always manage to make a few up on the start. I must say though with 60 cars out there it was hard to find a spot where you did not meet traffic. Low and behold I am behind Dave Hinton’s XK120 again but driven by his brother Andrew this time - looked like another recipe for fun! It is so much better while I am learning this car to be near good cars and drivers of which Dave, Andrew and the XK120 are. We formed up on the grid and there were clouds in the sky. I looked over and saw new tire stickers on the XK120 and thought “ah, mine have many laps on them” - people say it is bad luck to remove tire stickers but I believe we keep them on to phase the opposition. We finish the warm up lap then we are off - Andrew in the 120 went left and I went right - by turn one we were side by side and had passed five cars in the process. By the second lap I was up to 15th with Andrew in the 120 behind me - we stayed that way for three laps. Then the rain came - only light and only over half the track but enough for me to reel in another five cars ( I had my first pole and won my first race at Sebring in the wet racing my Fiat Spider). At one point I split two 911 Porches into the hairpin by the hotel - that was exciting especially getting a little sideways on the exit. I think my previous rain driving experience helped - the car was different but the track was the same. It has fast wet parts if you know what I mean. The 120 dropped back a little but ended up being just 1.5 seconds behind me at the finish. As we pulled up pit lane I was waived over to the wall - I thought “man, what did I do wrong?” Then someone called out, “Sean, come on, get out, you got second place.” I could not believe it - the rain must have claimed more than I thought. If I look shocked it’s because I am - my second feature race in the E and I finished second - WHAT HAPPENED? This is remarkable - the second time I have run this race and my pal Kevin has been offered a drive by Paul Hand, one of the English guys who stayed after Daytona (earlier in November), and being a true racer Kevin accepted. Driving the 6L XJS of Richard Masters, Kevin had managed to qualify ahead of me despite never having raced at Sebring before. The XK120 also was in front of me - this time driven by Wavey Davey. Ours was supposed to be the last session of the day - about 5 p.m., however due to a rain postponed Historic Stock Cars feature race that should have been raced on Friday, they were sent out ahead of us which postponed the start of our race. Sitting in the E on the false grid, I watched Dave’s car slowly melt into the darkness beside me thinking that he has no lights and neither do I. Instead of an eight lap race, the officials announce that it’s going to be reduced to only three laps - silly me, I thought they were going to cancel or postpone to the next morning. We followed the pace car - it had lights and somewhere ahead so did Kevin in the XJS. Now at this point you might think we or someone was completely out of their minds? The flag dropped and we drove off into the dark. At the hair pin turn (by the hotel) Wavey and I came across Kevin spinning out - now this guy had only a few laps under his belt at Sebring and now here he is out in the dark - back on the track, we followed him as he had one headlight and was showing us the way (kind of). Kevin added some straights that were not there before and a couple of corners - amazing how he got round at all! I was driving by shapes in the sky I recognized and Wavey later said he was driving by brail. I followed them both - the only thing to do was get them in the last corner (Sunset Turn) meanwhile there were cars spinning all round the track so on the last lap I wound it up down the back straight and dove for the inside using the outline of the trees on the bridge to judge where I was. I came out the other side ahead and ended up the second brit sports car - it was a Jaguar 1-2-3 finish - Larry Ligas, me and Dave Hinton - all with Terry’s engines. Kevin was right behind us - no medal this time but what a great effort - if it had been light he would have taken second. The end of season banquet and awards presentations were held that night at the track and I felt great - second time out for me and two medals plus I had won my class, the food was great - HSR know how to look after you along with their great sponsors. We sat around discussing what a wacky race the last one was and how we should have done it differently. I suggested we ran in the rain instead of the stock cars - it would have been a lot easier. I unloaded the car Sunday and noticed brake fluid on the floor in the trailer. On inspection we found a cracked line so capped it off to run on one rear brake - after all this race was just for fun! First mistake! We fuelled up and some how left the cover off the fuel cell (not the cap but the trap door) - second mistake! So off I go - great start down the inside making up five places in the first lap. I noticed the fuel door sliding around realized what had happened although distracting it was no big deal. The brakes felt OK - not like they were but manageable. Right behind me pushing hard was a bright green Porsche 911 - he had his lights on so it was not hard to notice him. I think he was a little better through some corners but not all of them and on the straights the power of the XK was far superior however he was there behind me pushing as fast as he could. I was beating my best lap time by as much as one second a lap - even on three brakes there are parts of the track where I know I can go faster but do not have the confidence yet. On the last lap going through the carousel I put two wheels on the dirt and the bright green Porsche 911 got by - 3rd mistake! I chased him hard but had lost the momentum on the last corner I was reeling him in but ran wider than I had all weekend and unfortunately got on the dust and marbles and took off into the tire wall - last mistake! So a new hood, radiator, etc have been ordered. These cars are very strong and durable so I will be back in action in the new year - hopefully wiser - slightly poorer though I did knock 3 seconds off my best lap in that last race - priceless!